Omaha Door Company, as it was originally called, was started in 1959 by Leo Murnan and Joe Nothomb. Leo came back from a tour of the Pacific Ocean, sponsored by the U.S. Navy, in 1945. He worked at Murnan Rug and went to school at Creighton University. After graduation Leo went to work for O’Keefe Elevator Co. One day, O’Keefe’s announced that they were buying the local Overhead Door franchise as the current ownership had just gone broke. They transferred the inventory along with a shop man named Joe Nothomb. Selling doors is a rough and tumble kind of business, with a lot of competition and low markups. The day finally came when O’Keefe threw in the towel on their door division. They sold their franchise to a buyer in Lincoln, Nebraska. Most of the employees left, but Leo and Joe stayed to help liquidate the inventory. The inventory was reduced to the point that all that was left was an old red truck and a few remaining parts. In the mean time, Leo and Joe decided that perhaps they could start their own company. They went back to Dennis O’Keefe and proposed to help O’Keefe eliminate the remaining inventory and the truck if Dennis would co-sign a start up loan. Dennis agreed and Leo and Joe were ready to start selling doors. Omaha Door was open for business in November of 1959, in a small building in South Omaha, at 36th and “T” Streets. The first few years, they concentrated on selling garage doors and garage door openers. A basic wood panel residential door sold for $73.95 installed. The company grew and had 30 employees by the late 1960’s. Somewhere in this period the name was changed to Omaha Door & Glass as the company began installing patio doors and doing small glass jobs. The 1970’s showed increased growth. The Hollow Metal Department was added in 1976 to sell commercial walk thru doors. In 1979 the Service Department was added to make sure the customers’ needs were quickly addressed. As the company grew, the warehouse became overcrowded. Two additions were added to the original warehouse. It soon became apparent that no more additions could be added to due to lack of land. A new building was built at 4665 “G” St. and opened in 1980 keeping its South Omaha Roots. As soon as the new location was finished, a recession hit the construction business. It was during this time that the Window Department was added in 1981 to expand our product lines. At the time that windows were introduced, Omaha Door & Glass officially changed its name to Omaha Door & Window. In the late 1970’s Leo’s partner, Joe Nothomb, retired and sold his shares to Leo. Meanwhile, Leo’s family grew to 8 children, which included four sons and four daughters. One by one all four boys and two daughters came back to work full time after getting their college education. That’s when the company really started to move. As Omaha Door and Window continued to expand in the 1980’s, loading dock equipment was added, to compliment the commercial door business. In the 1990’s, the Siding Department was added. 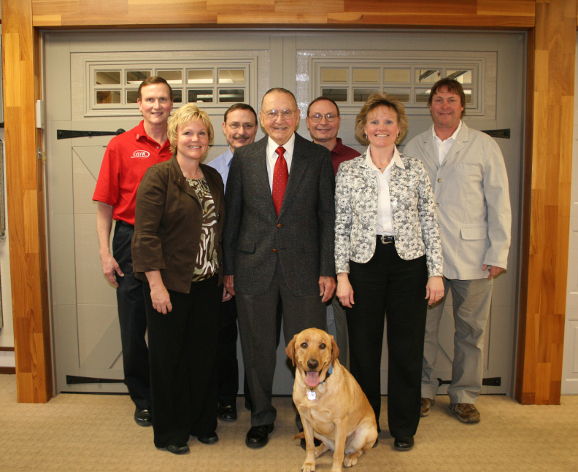 In 1991, due to the concern of consolidation of garage door companies nationwide, Omaha Door and Window became a shareholder in Mid America Door Company in Ponca City, Oklahoma. Mid America Door manufactures both residential and commercial garage doors. 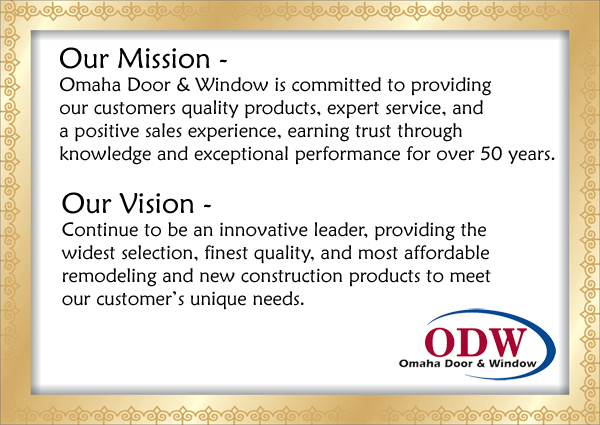 Today Omaha Door and Window owns two buildings in the metro Omaha area, has a team of over 100 people in our personnel, and a fleet of 60 vehicles. We are dedicated to serving our customers needs. We constantly research the market for the best products and quality materials which provide fair pricing to our customers.